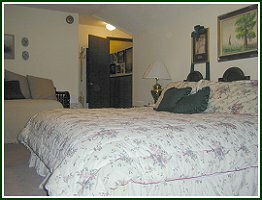 The Blue Room offers a queen bed for 1 or 2 people. 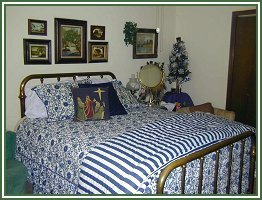 The brass bed provides roomy comfort with luxurious quilts. Sally's paintings add a personal touch from your hosts. The second Guest Room sleeps 1 to 4 people and features a huge king size bed plus a day bed, dressing table and private bath. The Studio is perfect for the family or traveler who wants complete features including Queen bed and a Daybed, Kitchenette, private bath and your own entrance. Working out of here periodiaclly or want to make this site your central location for your vacation. 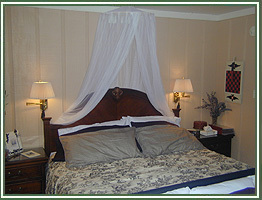 We are only 1 hour from New Orleans, only 1 hour from the Plantation Country, only 1 hour from New Iberia. 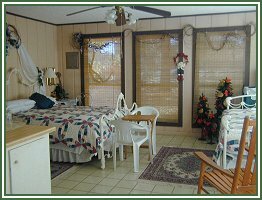 All guests are welcome to enjoy television, laundry facilites, telephone, fax, computer, e-mail, swimming pool (seasonal, it still gets cold here) and heated Jacuzzi. Smoking is permitted with restrictions. Web Design by Aardvark & Associates, Inc.